Typhoon Prapiroon is moving into the Sea of Japan and was lashing the Korean Peninsula and southern Japan when NASA-NOAA's Suomi NPP satellite passed overhead. The Joint Typhoon Warning Center noted that animated multi-spectral imagery showed the ragged eye had become cloud filled by 5 a.m. EDT (0900 UTC), as convection began to elongate and shear (pushing the clouds and storms away from the center) with the mid-latitude westerlies (winds). 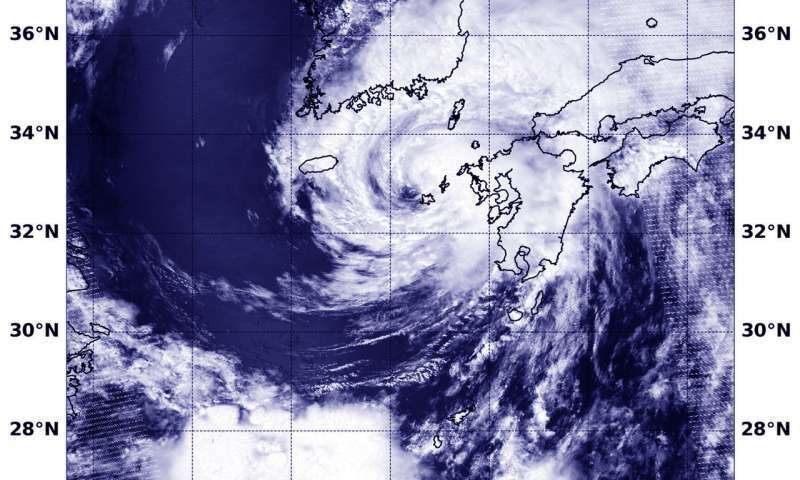 At that time,Typhoon Prapiroon was centered near 33.4 degrees north latitude and 128.9 degrees east longitude, about 44 nautical miles west-northwest of Sasebo, Kyushu Prefecture, Japan. Maximum sustained winds were near 75 mph (65 knots/120 kph). Prapiroon was moving to the north-northeast at 16 mph (14 knots/26 kph). Prapiroon is now moving north-northeast and is weakening because of increasing vertical wind shear and its movement over cooler sea surface temperatures as it passes into the Sea of Japan.